Earlier today read a very good article on secondary fermentation from Home Brew Supply. It backed up what I've suspected and experienced. I'll summarize here and share my experiences. Techincally, secondary fermentation is any period of additional fermentation or conditioning that takes place following the primary fermentation period. Generally speaking, secondary fermentation involves transferring a beer out of its primary fermentation vessel into a second sanitized vessel. The point of secondary fermentation is to get the beer off the original cake of yeast and the sediments that have fallen to the bottom of the fermenter. When yeast goes dormant at the end of fermentation and begins to die off, the yeast cells will disintegrate and give off chemicals that negatively impact the flavor of your finished beer. Is Secondary Fermentation Still a Valid Process? The secondary fermentation process came into existence in the early days of home brewing. In those days, the available brewing yeast often wasn't the most viable, and less was known by home brewers about how to keep yeast healthy. As a result, the death and disintegration of the yeast cells (known as autolysis) was a very real possibility that could ruin a batch of beer. Also, brewing ingredients, equipment, and methods were less advanced than they are today, so there was often plenty of sediment remaining in the beer after fermentation finished. Transferring a beer to a secondary fermenter was a way to avoid off-flavors from autolysis and allow more of the sediment to fall out of the beer, making it clearer. If you're using relatively fresh yeast, treating it well, and using good brewing practices, most experts say that secondary fermentation is mostly pointless. Yeast is unlikely to undergo autolysis during the first month or so of fermentation, and most modern tools and techniques result in clear beer. Are There Risks Associated with Secondary Fermentation? Any time you disturb a beer before it's bottled or kegged, there is a risk associated with this. If the beer comes into contact with too much oxygen, it will develop cardboard-like flavors. If the transfer tubing or secondary fermenter aren't properly sanitized, bacteria and wild yeast may enter the beer and cause spoilage, souring, or unwanted off-flavors. There's also a possibility of spillage... and no one wants that. Are There Times When Secondary Fermentation is Worthwhile? A good rule of thumb is that if your beer isn't going to be fermented longer than 4-6 weeks, there is no good reason to incorporate a secondary fermentation step. Extended fermentation or aging: The longer you plan to keep the beer in the fermenter, the more risk there is of autolysis occurring, though these days it's still pretty low. Anecdotal evidence (of mine and others) suggests that even up to five months, depending on yeast strain and recipe, isn't too long to keep a beer in the primary. A good rule of thumb, though, is to transfer to a secondary fermenter after about a month. Large additions in secondary: If you plan to add a lot of fruit puree or some other large addition during secondary, it may be better to put those ingredients in the secondary fermenter and carefully transfer the beer onto them, rather than dumping those ingredients into the primary fermenter. This is because you could churn the beer too much adding these items and cause it to oxidize. If you're careful, though, this may not be an issue. I've personally had beers stay in their primary fermenter as long as three months without racking them off to a secondary. Those beers were as tasty and clear as any I've transferred to a secondary. Then again, I try to keep my yeast healthy in primary by providing it with yeast nutrient and oxygen from the start, so your experience may differ. There's no substitute for experience. Perhaps the next time you brew a beer that you would normally transfer to a secondary fermenter, you might try only transferring half of it and leaving the other half on the original yeast cake, to see if you can tell a difference in the two. You may decide, as I have, that most of the time it's a waste of my time and effort. Back in January, I brewed my first Belgian Quadrupel. It turned out so well that I have only 4-5 bottles of it left, and that's only because I've been jealously guarding them. I decided to brew it again today, and also to change it up a little to see if I could improve on it. Version 1.0 of this recipe turned out to be one of the best beers I'd ever brewed. My friends, my wife, and I happily went through most of it within a few weeks of bottling. The beer was slightly sweet, had a nice raisin/plum flavor, and a great aroma of spice and fruit. Despite being over 9% alcohol, it was a very easy to drink beer. Pilsen malt was dropped from 12.5 pounds to 12 pounds, and 8 ounces of Melanoidin malt were added. This was done in the hope that it would improve head retention in the beer relative to version 1.0. Special B was increased from 4 ounces to 5 ounces, because I had an extra crushed ounce of Special B left and just wanted to use it up. Turbinado sugar was dropped from 8 ounces to 4 ounces. D-90 syrup was dropped from 16 ounces to 4 ounces. Brewer's Crystals were left out - I'd only added them last time to hit my target gravity. The 4 ounces of raisins were eliminated. In place of the reduced Turbinado, D-90, and raisins, I used a two-pound jar of Iraqui Date Syrup I'd purchased at Jungle Jim's earlier. My hope was that this would provide a good substitute for the raisin flavor in version 1.0. Since I didn't want the percentage of adjuncts to exceed 15% for this version, I dialed back the D-90 and Turbinado so that the total worked out to approximately 15%. The beer was prepared in The Grainfather, then transferred to an SS Brewing Technologies Brewmaster Bucket fermenter. The fermenter was equipped with a fermwrap heater and Cool Zone cooling jacket, with an Inkbird temperature controller, inside an insulated bag. Cold water for the Cool Zone jacket is provided by a mini-refrigerator with a plastic water-filled bin inside it. 5.5 gallons of tap water were placed into The Grainfather's kettle. Part of a Campden tablet was dropped in to neutralize chlorine and chloramine, while the the kettle heated the water to 152F. When the water reached the desired temperature, grain was gradually scooped and stirred into it until the entire grain bill was in the kettle. At that point, the perforated lid and overflow tube were installed, the glass lid placed over the kettle, the recirculation tube installed, and the pump switched on. Mashing was done for 120 minutes at 152F. After mashing, the kettle temperature was raised to 170F and held there for 10 minutes. The grain basket was lifted out and began to drain. 2 gallons of sparge water were heated in a separate vessel during the end of the mash process and gravity-transferred into the grain basket to sparge it. Resulting kettle volume was around 6.5 gallons. Pre-boil gravity was 16 Brix on the refractometer. The wort was brought to a boil, with a 90-minute boil schedule. For the first 30 minutes, the wort boiled without any hops. Unlike the previous batch, I didn't use any Fermcap to prevent boil-over, but instead stayed there until the foaming stopped on its own, stirring the kettle as needed. After 30 minutes of the 90-minute boil, The Northern Brewer and Styrian Goldings hops were added in a hop spider and bag. At 15 minutes left in the boil, the yeast nutrient and Whirlfloc tablet were added. At 10 minutes left, the date syrup, Turbinado sugar, and D-90 syrup were added. At about 7 minutes left, I began circulating boiling wort through the counter flow chiller to sterilize it. At 5 minutes left, I added the coriander and grains of paradise. At 3 minutes left, I added the Czech Saaz hops for aroma and slight flavor addition. When the boil was finished, the pump was switched off, the heating element switched off, the hose out of the counter flow chiller moved to a sanitized fermenter, cold water turned on for the chiller, and the pump reactivated. Chilled wort began flowing into the fermenter. Due to the relatively warm weather and tap water, the counter flow chiller only brought the wort down to about 80F. The recipe called for the yeast to be pitched at 72F, so I moved the fermenter to my fermentation temperature control system and switched it on. The system began chilling the fermenter from 80F down to 72F. A while later the target temperature was reached. My brewhouse efficiency on this one was estimated by BeerSmith to be 81.5%. Not bad. The yeast was pitched at 72F and the fermenter sealed up in its temperature control apparatus. The plan is for the beer to remain in the fermenter for 3 weeks before being transferred to a secondary fermenter. It will spend 1 week in secondary before being bottled. On June 26, 2016, it should go into secondary. On July 3, it should go into bottles. That will make it ready for consumption somewhere around July 17, 2016. I'll be back to add more notes and a final gravity reading when I'm ready to bottle it. Due to a lot of non-brewing activity on the home front, I never transferred the beer to a secondary fermenter, so it's remained in the primary since the day it was brewed. 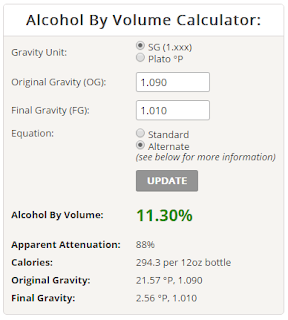 A sample measured with a hydrometer registered a final gravity of 1.010. 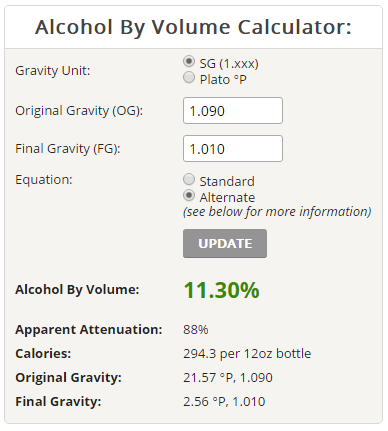 Given the starting gravity of 1.090, the Brewer's Friend ABV calculator (output shown at right) says this beer reached 11.3% ABV and achieved 88% attenuation. That's much better than I got from the last batch and higher attenuation than I expected. The sample in the hydrometer had a nice coppery brown color typical for a quad. The fermenter had a fruity bubble-gum-like aroma to it, implying that the Belgian yeast had done its work well. I boiled 164 grams of D-90 candi syrup for five minutes to provide the priming sugar for the beer. According to the Candi Syrup, Inc., web site, this should get me a CO2 volume around 2.7-2.8. I'd have gone higher, but they claim that many bottles will burst at 2.8 and above. In addition to the D-90, I rehydrated a packet of Red Star Champagne yeast to provide a fresh yeast for carbonation. Most of my bottles ran through the dishwasher and were then soaked in Star San before use. Some received only a rinse and Star San treatment. I wanted to know if cleaning the bottles in the dishwasher improved beer flavor and head retention at all, so I labeled each bottle accordingly. I've also found in some cases that I'm not giving my beer enough priming sugar, which may be why some of them haven't carbonated properly. In addition to the D-90, I added 1-6 small size carbonation tablets to some of the bottles and labeled them accordingly. For this reason, I'm actually expecting to have some "bottle bombs" this time around. I placed all the bottles, whether primed with just D-90, or a mix of D-90 and drops, inside plastic bins with clip-on lids. If they burst, they should make a mess inside the bin but not elsewhere. July 9, 2016: Since I bottled this beer with champagne yeast and (in several bottles) extra sugar, I wondered if it might be decently carbonated after only a single week. I put a bottle in the refrigerator today and let it chill for a few hours. Examining the closed plastic bin in which the bottles are conditioning, I saw that none of the bottles had burst yet. That was a good sign as far as I was concerned.